H.C. Bankole-Bright enrolled at the Edinburgh Royal College of Surgeons in 1905 and qualified as physician in 1910. He ran a medical practice in Freetown Sierra Leone, before becoming a prominent journalist and politician; he was elected to the Sierra Leone Legislative Council in 1925. 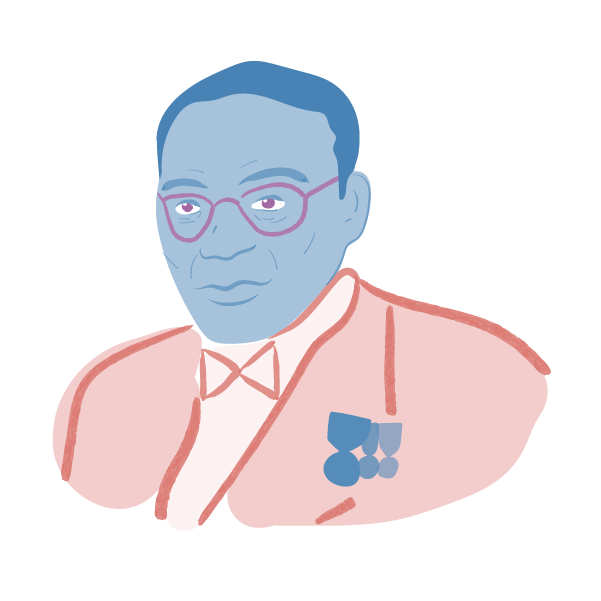 His colourful life has been documented by Akintola J. G. Wyse in the 1990 Cambridge University Press biography H.C. Bankole-Bright and Politics in Sierra Leone, 1919-1958 and in a short biography, by Christopher Fyfe, that can be found at Oxford Database of National Biographies. “Bankie” was born in 1883 in Okrika, on the Niger Delta, on the edges of Igbo country (which later became part of Nigeria) to Jacob Galba Bright and Letitia Bright, who were travelling there at the time, as merchants. The Bright family belonged to Freetown’s African social elite. Jacob was a diplomatic agent for Sir George Goldie’s expanding commercial empire on the lower Niger River; he had studied medicine in London in 1865 but his studies were interrupted when he had to return to Freetown upon the death of his own father to take up the family business. In 1892 he was a founding member of the Sierra Leone Chamber of Commerce. They were a “Krio” (“creole”) family; Jacob’s father (Bankie’s grandfather) has been rescued from a recaptured slave ship in 1823, landed in Sierra Leone, and was then baptized and educated by the Church Missionary Society. Late eighteenth-century and early nineteenth-century British philanthropists created Sierra Leone with the hope that its Krio population of freed slaves would become “beacons of light” for the civilization—as understood by British religious-philanthropy—of Africa. Bankole-Bright was brought up in a home environment that was, according to his biographer “imbued with high religious fervor, a strict code of discipline, a mid-Victorian infatuation with personal industriousness and moral conscience, and a rigorous adherence to the tenets of the Church.” Bankole-Bright and his two brothers, John St Hawley Ekundayo Bright (who went on to study commerce in Germany) and John Galba Iwuchuku Bright (who studied Law in England) attended Methodist Boys’ High School, one of two premier schools in Freetown. Students from that school or the Anglican, Church Missionary Society Grammar School were expected to form a new African elite and continue their studies at Fourah Bay College or abroad. Bankole-Bright was nominated “Dux” of his school. From an early age he was fascinated with public speaking and debating and became renowned for his brilliant eloquence. He was described as a “verbal gymnast” who could “charm a bird from its perch.” After finishing high school Bankie was apprenticed under the famous Doctor W. Awunor Renner, the Principal Medical Officer of Sierra Leone. Doctor Renner, one of the first West Africans to study in Britain, had studied medicine at University College (London), Liverpool and Brussels in the 1870s. In 1905 Bankole-Bright enrolled at the Edinburgh Royal College of Surgeons. At that time, the College was autonomous from the University of Edinburgh, but its students were required to take certain general courses at the University. He enrolled on the standard, five-year professional degree course at the College that led to the L.R.C.P. & S (Edin.) and L.R.F.P. & S (Glas.). The curriculum included courses in Therapeutics, Surgery, Surgical Anatomy, Midwifery, Medical Jurisprudence, and Anaesthetics. During his five years Bankole-Bright practiced at the Royal Infirmary in Edinburgh and the London Hospital, and for six months he was apprentice to a Doctor Campbell in the city. He was academically successful achieving marks between 60 and 75 for all of the courses in his final examinations. While an Edinburgh student, Bankole-Bright resided at Lauriston Gardens. He took an active interest in politics and even wrote to Keir Hardie, the founder of the Labour Party in Britain. In 1906, in reply to one of Bankie’s letters, Hardie wrote: “I hope the day will speedily come when your race will be able to defend itself against the barbarities being perpetrated against it by hypocritical whites, who regard the blackman as having been created in order that they might exploit him for their own advantages.” Bankole-Bright, who had been a keen high-school debater, participated in debates as a university student including one organised by the University’s Afro-West Indian Association in 1906. He was inducted into a Scottish branch of the masons, but did not, apparently, attend many (if any) meetings. At Edinburgh, Bright was contemporaries with Ishmael Charles Pratt, another Sierra Leonean who registered in 1904, Richard Akiwande Savage from Nigeria, who left Edinburgh in 1903 and Bandele Omoniyi, a student activist and author of A Defence of the Ethiopian Movement (1908). In 1927, 17 years after he had returned to Sierra Leone, Bankole-Bright was named Honorary President of the Edinburgh African Association. Upon his return to Sierra Leone in 1910 he married Addah Maude Bishop, who would later sing a solo for pan-Africanist W.E.B. DuBois when he visited the Bankole-Bright’s home in 1926. Addah Maude Bishop was also from an elite family. She was the youngest daughter of Theophilus Colenso Bishop, former Mayor of Freetown (1898).Bankie and Addah had two sons and two daughters. Their two sons were sent to London for primary schooling and went on to study Medicine and Law (respectively) in England. One of their daughters also studied Law, the other died young. When he began his biography of Bankie in the 1970s, Wyse found that “What little was said about him was presented in negative terms” and that there were “strong prejudices connected with his name.” Fyfe states that Bankole-Bright’s “private life was notoriously disreputable” and refers to a notorious incident when Bankie took charge of his dying father in 1910 and made him sign a will in favour of him and his brother instead of his stepmother. According to Fyfe, Bankole-Bright was also involved in a number of lawsuits, including some relating to sexual scandals. Although Bankole-Bright set up a medical practice in Freetown, journalism and politics soon took over his interests. He founded and edited the radical Aurora newspaper, a weekly tabloid with an “unrestrained” approach and an “abrasive” tone which launched stinging attacks on European officials. He supported the National Congress of British West Africa, a pan-Africanist organisation, attended the inaugural meeting in Accra in 1920, and ran the Sierra Leone branch until 1939. He helped to set up the West African Students’ Union in London in 1925. Together with Ernest Beoku-Betts, Bankole-Bright was elected to the Sierra Leone legislative council in 1925. He persistently argued for legislation to end racial discrimination in government service, workmen’s compensation, extension of the franchise, and supported the railway strike of 1926. He was “a fearsome orator, uttering his lengthy tirades in a roaring voice.” After 1939 his political career was defined by his rivalry with the “outspoken radical” Isaac Theophilus Akuna Wallace-Johnson (1894-1965) who established the Sierra Leone Youth League. In response to the rise of Wallace-Johnson and the “fiery populist” rhetoric of the Youth League, Bankole-Bright became increasingly conservative, supporting government legislation aimed to tighten control on the Youth League that he would have formerly strenuously opposed. As the colonial office moved towards decolonisation in the late 1940s, Bankole-Bright became even more conservative, leading the Krio group, the “National Council.” Bright and the National Council set out to protect the interests of the small and hitherto protected Krio community against those of the African colonised population. They argued that as the favoured British subjects, they had the right to take on the responsibility of government. This was a cause pursued by Bright all the way to his death in 1958, and a cause for which he lost a lot of popular support and his seat in the legislative assembly. When Bankole-Bright died in 1958, President Margai called for him to be remembered for “his wit, his lively debates, and his ability to put his point across very effectively during his leadership of the official opposition of the last government.” He praised “the grand old gentleman of politics” for his pioneering contributions to West African journalism, to his commitment to his country Sierra Leone and to the general cause of freedom and justice. Wyse A.J.G, 1990, H.C. Bankole-Bright and Politics in Sierra Leone, 1919-1958, Cambridge University Press. Fyfe, C, 1992, H. C. Bankole-Bright and Politics in Colonial Sierra Leone, 1919–1958, African Affairs, Volume 91, Issue 362, pp.150-151. 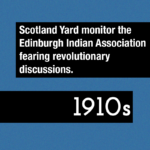 NEWER1910s – Scotland Yard monitor the Edinburgh Indian Association fearing revolutionary discussions.